The tale of woe for Amonix seems to have reached the point of no return, with news that the struggling concentrating photovoltaic (CPV) startup has closed the Las Vegas factory it built with $6 million in federal tax credits. The Las Vegas Review-Journal reported Wednesday that the company began selling surplus equipment in an online auction Wednesday. Calls to the company's Seal Beach, Calif. headquarters were not returned, the newspaper reported. The paper also quoted a former employee as saying that the plant, which once employed as many as 700 in triple shifts, has been idle since May, the same time the company reported laying off 76 employees. The employee also said that the company had about $100 million in debt, including $34 million owed to Flextronics. It's unclear what effect Amonix's apparent collapse will have on the 30-megawatt Alamosa Solar plant, built with its panels by partners Cogentrix, a subsidiary of The Goldman Sachs Group that's mostly financed fossil fuel plants. The Alamosa project went on-line in May, stealing the crown from the 5-megawatt Hatch, New Mexico plant, built with Amonix panels and operated by NextEra Energy Resources, as the country's biggest CPV installation. Amonix's closure may not have an immediate effect on the plants' operations. On the other hand, Greentech Media has heard unconfirmed reports that disturbing numbers of the Amonix 7700 trackers at the Alamosa and Hatch installations are stowed and not operating due to quality issues in manufacturing. While company officials didn't comment on the factory closure, Nevada Sen. Harry Reid did, commenting via email to the Review-Journal that the company's fate shouldn't be used for political advantage. "Last year, Amonix CEO Brian Robertson was tragically killed in a plane crash and unfortunately the company was unable to recover from this difficult time," Reid's statement read. "Some people will be tempted to use today's unfortunate news for political gain. But I am hopeful that the bipartisan support for this project and the public-private partnership that helped make this and many other projects possible will not be degraded by dirty energy supporters for their own profit or political gain." 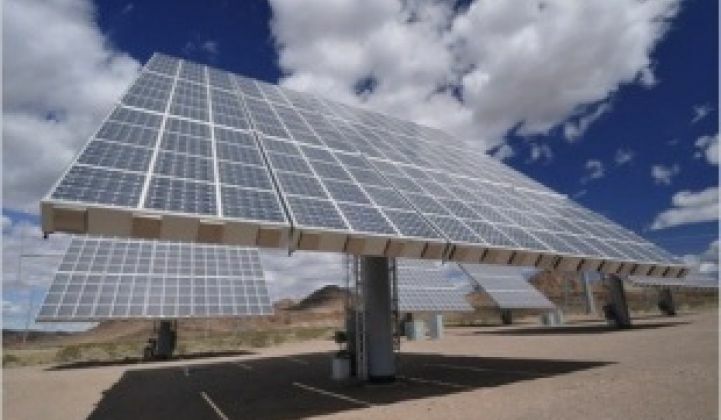 It's a not-so-subtle attempt to deflect talk about Amonix being another Solyndra, or being lumped with other federally backed solar companies like Abound Solar that have gone under in the past year. Amonix landed $6 million in tax credits to build the factory, and also got a $15.6 million Department of Energy grant, and Cogentrix won a $90.6 million loan guarantee for the Alamosa project. Amonix has raised approximately $140 million in venture capital from Kleiner Perkins, Adams Street Partners, Angeleno Group, New Silk Route, PCG Clean Energy & Technology Fund, Vedanta Capital, Westly Group, and MissionPoint Capital Partners. Its intention appeared to be to scale big and fast to prove that its high-efficiency (and high-cost) CPV panels could compete in the market. That approach does not appear to be working in an era of very-low-cost flat-panel photovoltaics, however. Sources close to the company indicate that the firm is seeking to close on more VC funding. Here are some more troubling observations from last month. The Amonix booth at SNEC in Shanghai was not populated, and we've heard from a vendor that is having difficulty collecting on money that Amonix owes them. Paul Russell, former SVP of engineering at Amonix (and still listed on the Amonix website), is now at Array Power, the solar distributed electronics firm. Geoffrey S. Kinsey, previously Senior Director of R&D at Amonix, is now at The Fraunhofer Center for Sustainable Energy Systems as the Director of its Photovoltaic Technologies Group.